There are a number of ways in which we can determine whether or not we have a hobby or a business. Does it make a profit? Do you wing it or run it with a plan? Do you refer to it as your business or do you brush it off as ‘oh, just this thing I do?’ Do you know every detail about the money—where it comes from, what your expenses are, what your profit is? That last one is what I’m here to help with today. Knowing exactly where every single penny is coming from or going in your business is powerful and crucial to your success. At the beginning of each month you should be setting goals for how much money you want to make in your business. But how closely are you tracking what happens after that? Are you actively keeping tabs on how much in revenue, expenses, and profit you are doing each month? Are you evaluating those numbers and the information to adjust and tweak and improve? If you have multiple income streams are you tracking them all separately so you know how each one is doing on their own? If not (or even if you are but you want some pretty sheets to start using! ), download the Monthly Money Report below and get to work tracking where your money is coming from and going. At the beginning of each month, fill in the goals you want to hit. At the end of each month, track your revenue/expenses/income and compare to the goals you set on the 1st. Did you hit your goal? Awesome! What did you do to get there? Did you miss your goal? That's okay, evaluate what you did and what you need to do moving forward to get you to that mark! Do this each month to track your progress and keep tabs on that money, honey. This evaluation is what will give you the information needed to grow. If you had a goal of making $500 in January and you ended the month with a profit of $350 you can easily look back at the past 31 days and see what you need to do moving forward. Maybe you only posted about your products three times in the entire month because you didn’t want to seem pushy so now in the new month you should try posting six times and see if your income rises. Maybe you left flyers for your local service based business in four locations around town and now this month you know you need to aim for ten. And if you did hit your goal (or exceeded it), use your evaluation to determine what worked the best so you can repeat it. If you got the most sales after your heartfelt post about why you made a product, channel that again moving forward. If you left flyers in four places and got three new clients all from the same place, you know that that is a good location to keep restocking with your marketing materials. The main thing here is that we can’t focus on and get caught up on those times where we don’t hit our goal. The purpose of tracking our business money in this detail is not so we feel bad when we miss our mark. It’s going to be the catalyst for your growth, I promise. If you wanted to make $500 and you came up short, THAT IS NOT A FAILURE. It’s a learning opportunity and that’s exactly how you are going to treat it! Figure out what does not work. Figure out what does. Adjust accordingly and keep chugging along, babe. If you are sitting there thinking that you may just have a hobby after all, don’t fret. Making the switch to a business isn’t as hard as it seems. Make a promise to yourself right here, right now, that you will start taking the steps to grow what you have into an actual business. 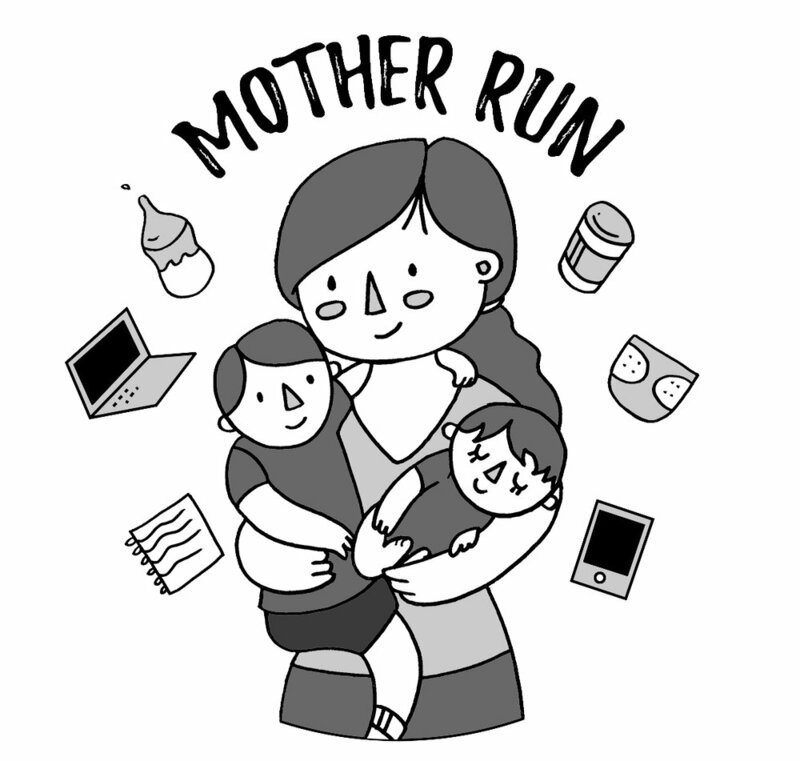 If you don’t know where to start, download the Mother Run Business Planning Guide and get to work. There is no time like the present to go after your dreams. Branding is incredibly important for small businesses. Everything you do to prepare your business sends a message. You want your message to be clear, trustworthy, and professional. It does NOT cost a lot to do this! It doesn’t matter how small of a business you have, branding is crucial. Here are what I think are the four most important branding points to keep in mind as you start or grow your business! I used to think I was passionless. I attended college for four years and bounced from major to major because I could never find anything that made me go “Yes! That’s what I want to do with my life!” Picking something to study just because it paid well or led to job security was never something I even considered (I think it’s important to note that this is an example of privilege, mixed with stupidity. My family wasn’t wealthy by any means, I had to use student loans to pay for college, so I’m not sure where my attitude of ‘it will all work out and I don’t need to plan ahead’ came from. I definitely don’t recommend this. If I had to do it over, I would definitely get a degree that I wasn’t passionate about, even if I didn’t think I would use it, just for security later on if it were needed). I switched majors four times in those four years and by the end of year four, I was burned out and done. I had yet to find anything that made me feel excited. I lost my motivation to study or try and my grades slipped tremendously. The end of that fourth year came two months before my wedding. The day after our wedding, we drove off in a U-Haul and travelled from Indiana to Florida for my husbands job. His job paid all the bills and required a lot of travelling and on-call work and we soon realized that me having a regular job meant we would never see each other. So I stayed home. In a strange state, full of strange people. I joined a roller derby team. I took up cross stitch and embroidery and opened my Etsy shop. I loved those things, but they weren’t my life's passion. I eventually quit roller derby two years in after seeing too many broken bones and other injuries and deciding it wasn’t worth the risk. I knew I wanted kids and I knew I could run an Etsy shop from home so I decided to focus on improving that. While it was a good fit for our life, and I did thoroughly enjoy it, my passion it was not. After spending three years in Florida, we moved back home to Indiana. My husbands job no longer included massive amounts of travel and I needed to find something to do with my time and something that wouldn’t make me feel like a lazy loser who had never had a real job. I always knew I wanted to be a stay at home mother and we knew that kids weren’t far off, so I opted out of finding that “real” job and decided to create my own. I started my pet sitting business without a ton of forethought. I wasn’t even sure that it would go anywhere, but I loved animals and knew I wanted a flexible schedule so I could continue my lifestyle of being able to do what I wanted, when I wanted. The first year was slow and half way through I found I was pregnant. I figured I would work as long as I could and after my son was born, I would shut it down and stay home. But as things picked up towards the end of that first year, I decided I loved it to much to quit and vowed to make it work, baby in tow. I genuinely love pet sitting and animals and for most of the two years I have been doing it, I thought that it was my passion (yes, you can really, really, really love something but have it not be your passion). Then my son and Doing Business and Raising Babies was born. You’re probably tired of hearing me say it, but DB&RB was created out of frustration after noticing that in all my mom groups, mothers were always told their only option for working from home with kids was MLMs/direct sales. Whenever a mom would post asking "what can I do to make money and stay home?" she was immediately bombarded with other women trying to get her to sell diet pills, wraps, nail polish, lip gloss, leggings, you name it. While these businesses work great for some, I hated that women, and stay at home moms specifically, were being told it was all they could do. I became PASSIONATE about creating a community that would showcase many different kinds of businesses that are mother run, show that it really is possible to do business and raise babies at the same time, and also help create content that would help anyone else looking to get started. My Etsy shop and pet sitting were fun and enjoyable and I loved them, but I know they aren’t my passion. Doing Business and Raising Babies isn’t a business in the same sense, it’s cost quite a bit of money and doesn’t really make any and yet I want to keep doing it and I’m so excited to see how it grows and so excited about the possibility of helping others. I know, without a doubt, that this is what I’m meant to do. It took me 28 years and a baby to finally find my true passion. To find something that sparks the best feeling inside, that I can get excited about day after day, that I can see doing for a long time coming, something that I don’t mind staying up late and losing sleep to work on, and something that doesn’t even feel like work at all. We always talk about self care as taking a bath, reading a book, watching your favorite tv show, painting your nails, buying some doughnuts, going to the gym, getting a haircut, etc. We treat self care as something we can do that makes us happy when we are stressed or overwhelmed. But what happens when the source of your stress and feelings of being overwhelmed stem from your business? As I talked about a little before, there is this ‘hustle’ culture that permeates our society and as small business owners we feel it even more because every part of our business is (usually) run by us. We are the boss, the employee, the creator, the maker, the marketer, the designer, the writer, the social media poster, the bookkeeper, the photo taker...we do it all. So when we get stressed or overwhelmed, we often turn to bits of traditional self care that involve doing something to make us feel better in the moment. We don’t usually stop to consider that our self care could be taking a small step back from our business. We are so conditioned to GOGOGO all the time. We are told you have to hustlehustlehustle 24/7 to be successful. That’s just not true. There is time to build your business and be successful without giving up all other parts of your life. Yes, going super hard into your business will get you results faster, but slowing down doesn’t mean you won’t get to those same results. It just means you’ll get there a little bit slower. As mother run businesses, we have so many other responsibilities to think about. If we get overwhelmed by trying to balance mothering, household tasks, our relationships, and our businesses...sometimes something needs to be taken off the table or scaled back. Our children and relationships can’t really be minimized. Household tasks can be to an extent, I’ll admit I sometimes live out of laundry baskets or pull clean clothes out of the dryer until the dryers empty, but they can’t be ignored completely. That leaves our businesses and it sometimes doesn’t even cross our minds that they can be slowed. So what are some ways we can alter our work in order to better care for ourselves? +If you have a handmade or product based shop and are overwhelmed by orders, turn your shop off for a week and get caught up! +If you run a service, see if you can hire an independent contractor to pass work on to when you are too busy! This is what I did in my pet sitting business as I approach the birth of my daughter and it significantly lowered my stress level, especially over the busy holidays. +If you run a service where you are taking on client work seven days a week, make it a goal to only take clients during weekdays. +If you make yourself available to clients 24/7, become more strict with your ‘office hours’ and let people know you’ll only be responding to messages during certain times. No one expects you to answer emails at midnight! Don’t neglect yourself in the name of your business. I know it can be hard when you have a lot you want to accomplish and there are dreams you want to fulfill. But think of how much better you will feel at the finish line if you didn’t run yourself into the ground getting there! How much greater will your completed goal feel if you can look back at the process without resentment? If you feel you have already struck a great balance and don’t neglect yourself while you hustle, that’s amazing! If you find yourself stressed on the reg about your business and overwhelmed by all you just HAVE to do, I’d like for you to identify one small change you can make starting today that will allow you to feel better and care for yourself more. This will look different for everyone. For me, I recently made the change that I would only stay up 3 nights a week to work. So please, ask yourself: “What can I do STARTING TODAY to eliminate stress and help me enjoy my business more?” Figure it out, implement it, stick to it, and enjoy a less stress filled biz. There’s something magical about new beginnings. Whether it’s the beginning of a new month, new year, or even new week, people tend to dream bigger at the start. It’s easy to make bright and shiny plans at the beginning of the year, it’s once they start dulling and becoming forgotten a little ways through where confidence and motivation can dwindle. I don’t know how accurate it is, but there is a commonly repeated statistic that says only 8% of people follow through with their New Year’s Resolutions. Even with such dire odds, I firmly believe that making plans and goals are good, even if you don’t see them through until the end. Good intentions carry weight and often what we have planned ends up morphing into something better or perhaps we even realize that it wasn’t such a good idea to begin with and we are then able to move forward and evolve. 2018 is going to look quite a bit different for me, my family, and my little businesses. As such, I’m goal setting differently this year as well. Adding a new baby into the mix in May is going to change the order of importance I place on my businesses and this little passion project. In addition, it will also mix up my daily schedule and call for a period of adjustment while getting used to two babies under a year and a half. No longer will I be able to do multiple pet sitting appointments a day, it’s hard enough sometimes getting one baby ready and out the door on time. I also won’t have as much time for my handmade embroidery shop, handmade is time consuming, though it will be slightly easier to pick this up since it doesn’t require getting multiple people ready to leave the house! Then there is this little passion project of mine. I have big plans for Doing Business and Raising Babies and since it is workable from a laptop or phone, it’s about to shoot up the list and become the main event. As I shift my focus from pet sitting and embroidery, a series of new skills arise that I need to learn. This can be very daunting task, and as I talk about a lot, this is exactly the time where fear arises. I have such big plans for this little growing community and not a lot of time before baby number two makes an appearance to get my ducks in a row. What better way to bring in the new year than with a list of goals and things to learn? Will I learn them all? Will I accomplish them all? Who knows! Will making a list and setting intentions help me on my new path regardless? Absolutely. Before making my 2018 goals list, let’s revisit my goals for 2017 and see how I did. 2) Become more organized and better at cleaning. Does hiring someone to clean my house twice a month count? 3) Lose baby weight from January birth. Nope, just got pregnant again instead! 4) Balance working and new baby. As we can all attest, this is pretty much always a work in progress and was a lofty goal for pre-baby Brittany to aim for. 5) Publish an ebook. Worked on a pet sitting business for moms ebook for the past six months and haven’t got to a point where I’m satisfied with it. Own worst critic, am I right? So basically 2017 me only fully accomplished one goal out of five, giving me a 20% success rate. Not great. 1) Work on learning new skills to benefit Doing Business and Raising Babies such as better website editing, learning how to grow an online community organically, and improving my writing. 2) Continue to work on pet sitting and embroidery to the best of my ability but do not get discouraged if I need to delegate more pet sitting appointments to my independent contractor or if I have to do much less handmade work. 3) Read as much as possible. 2017 had me reading about half the books I normally get through each year which made me feel awful, but by setting my goal to read ‘as much as possible,’ I hope that no matter how many I get through will give me an accomplished feeling. 4) Find balance, to the best of my ability, as we transition to a family of four. Do not get upset if it is harder than you think it will be and you have to make more sacrifices than anticipated. Above all, I plan to go into the new year with a series of questions in the forefront of my mind: Will this make me feel good about myself? Will it benefit my family? Will it add to my happiness or my stress? Will it take me closer to fulfilling my goals and dreams? By focusing on how every decision will make me feel and on progress (not perfection), I hope that at the end of 2018 I will feel much better about my accomplishments than I have this year. If you look at how much you have GROWN within each goal, it won’t matter as much if you fully achieved it. If you want to try out this method of resolution making, check out my guide for setting your own goals and intentions for the coming year! Don’t sell your product, sell the problem it solves. As soon as I saw this video on Sara Blakely’s Instagram stories I knew I had to share it and what it means to us as small business owners. Clyde is a 17 year old dog who’s owners did not want to leave at a boarders over Thanksgiving so they called me. Someone has a 15 year old dog—> they don’t want to board because he is old and will be stressed and anxious—>they look for alternatives and find me—> they hire me and their sweet dog gets to stay home in his own bed, with his own toys, stress free. Problem=solved. Knowing the problems people have that I could solve allows me to specifically sell my service to others like them. I can now make targeted posts addressing these issues and align myself as a perfect choice for elderly pets or anxious pets who might not do so well at a boarding facility. Someone needs to buy a gift—> they want it to be handmade so they open Etsy—> they want it to reflect the recipient's taste so they search for their favorite movie/tv show/musician/book/color/whatever—> they come across a piece I made that fits their subject parameters—> like it and purchase—> give it as a gift. Problem=solved. It’s not curing world hunger but I have allowed my client to fix their problem with my product. People order my embroidered children’s art pieces because they are looking for unique and meaningful gifts, often for grandparents of the little artists. Not every purchase solves a problem but every product can. I may stumble upon something I wasn’t looking for and buy it on a whim. I wasn’t looking to solve a problem, I just saw something I liked. However, that doesn’t change the fact that to someone else, that item does solve a problem. Figuring out what problems your product or service can solve will give you invaluable insight into who your target market is. Knowing who they are and marketing directly to them will improve your business. Target market is key in any business venture regardless if you are a small one person operation or a huge company. I hope this was able to help you even a little. If you are having trouble figuring out what problem you solve, feel free to ask me! I’d love to give an outsider's opinion or even help you get feedback from the DB&RB Facebook and Instagram communities! Something that I take pride in is the fact that I shop small A LOT. You should see how often I order for from Etsy. I love finding unique items that have been lovingly created and designed by real people, not a faceless corporation only after a big bottom line. I have put together a list of items for you on this Small Business Saturday that I picked out, purchased, use, and love. No ads here, just genuine love for handmade and small business. Bonus, the majority of the items in this list are made by moms (only exception I believe is the ring!)! Happy shopping! Click on image to link to product. All products are from Etsy. This black and white contrast block was a favorite toy of Wyatt's for months. It was one of the only toys he was interested in and it still is clipped to our car seat for him to use in the car! This one doesn't get much use yet play wise, but I currently use it to decorate Wyatt's bookshelf. 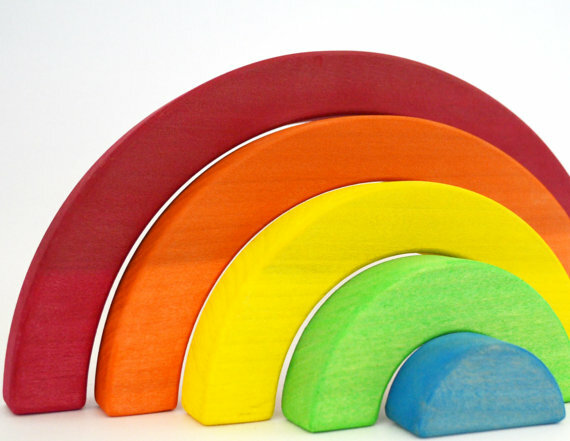 I have always loved wood toys and after seeing this I knew we had to have it to go with our rainbow one. The loose theme for our nursery was dinosaurs, as a Jurassic Park addict, how could it not be? This teether mixes my love of our departed friends with my love of all things natural and wood. This cream was a life saver during our first few weeks of painful nursing. I loved the fact that it's organic and didn't stain my clothes. I have a feeling it's going to become my best friend again since Wyatt has four teeth coming in now, ouch. I may use too many paper towels, but I do try to be eco-conscious in many other areas. 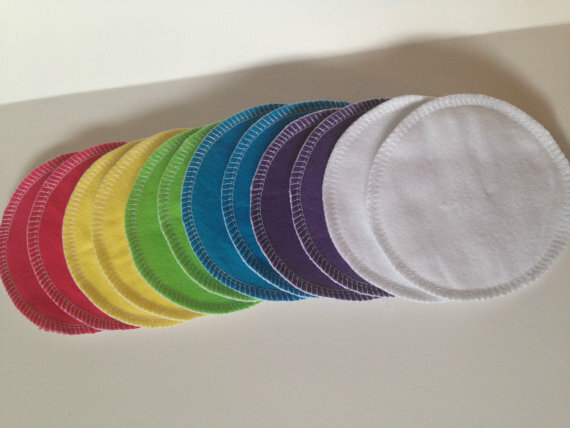 In addition to cloth diapering, I also went the washable and reusable route with my nursing pads. Super easy to care for and use, these pads were soft and comfortable and I highly recommend them. If you use a lot of pads, they are also super cost efficient compared to throw aways. This montessori inspired grab ball was the perfect addition to the wooden baby gym also listed in this shopping guide. Wyatt's tiny hands love how easy it to grab even though the ball is large. These dainty rings can be stamped with letters or numbers. Instead of a name, I had mine stamped with Wyatt's birthday in roman numerals. I wear it under my wedding ring and it never comes off. I highly recommend this is you're looking for something small and sweet to commemorate something special. I will definitely be ordering another once our new baby arrives in May! Share With Me is a book of collaboration illustration between a mother and her then 4 year old daughter. The illustrations are sweet and the fact that these two share the love of art makes it so special and unique. This breastfeeding tarot card is a proud member of my mom themed diaper bag pin collection. Show your support of breastfeeding with multiple color options. Little Literacy is a shop that takes classic literature and condenses it with cute illustrations for little readers. 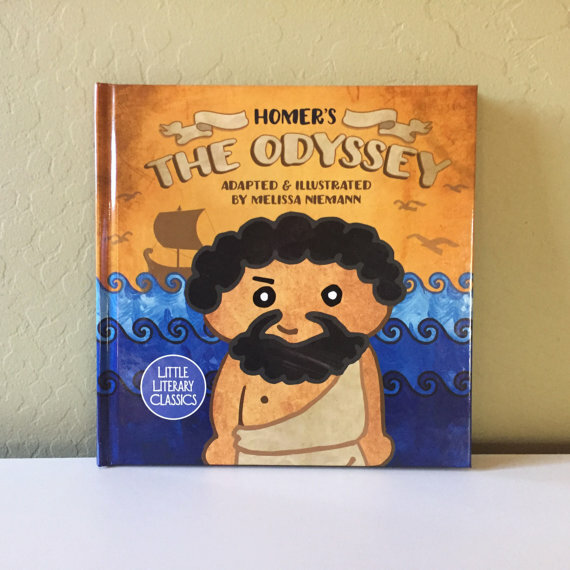 The Odyssey is one of my favorites so of course I had to get this for Wyatt! My love of cloth diapers and my love of mythical creatures combined to make this purchase happen. It is a cloth diaper so just throw in any insert and you're good to go in galactic unicorn style. The fact that so many different kinds of motherhood merch exist is amazing. If other types of mom gear aren't really your style, hopefully you'll find a kindred spirit in the Weird Mom Club. While sometimes bright plastic baby toys are unavoidable, that's not the case with this beautiful wood baby gym. Wyatt spent hours under this as a much smaller baby and still crawls to it to grab the toys hanging down. Simple and foldable, this gym is pretty, functional, and easy to transport to the grandparents. This brightly colored wooden rainbow sure does make our bookcase look pretty. I'm hoping it gets more play time as Wyatt gets a little bigger, but for now it was worth it just to use as a gorgeous decoration in the nursery. Note: This is from my Etsy shop but I wanted to include it because I think they are so special! Embroidered art keepsakes make wonderful gifts for parents and grandparents alike. These pieces are unique keepsakes that will be treasured for years to come! 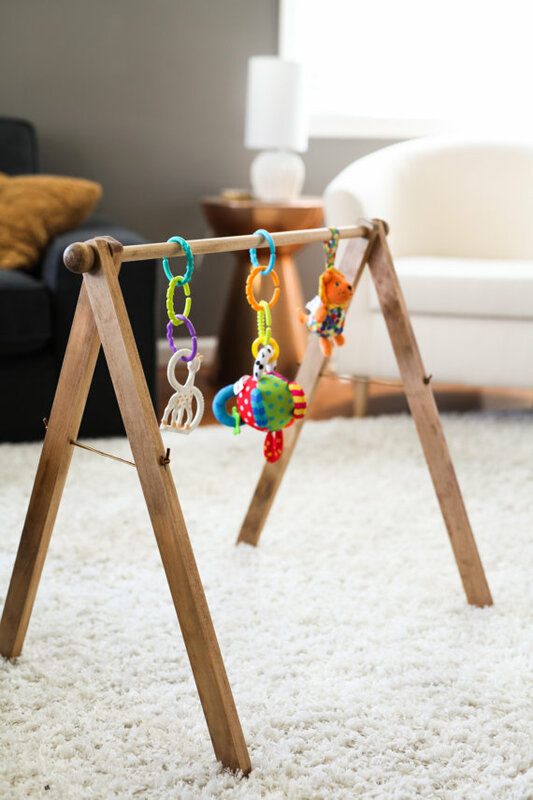 This teether is a mix of soft silicone and natural wood, making it great for curious babies who might get bored with only one type of material. This is one of Wyatt's favorite teethers. Disclaimer: This is going to sound like a QuickBooks ad, but rest assured, I have used this program for the last year and it was a game changer. You can use any method or program you like, the four basics will always stay the same! That being said, you can use this referral link to try it out for 50% off. The month by month overview QuickBooks gives you via the mobile app. This allows you to see trends and know when you busy times and lulls are so you can plan accordingly. Bookkeeping for your small business is very important and yet many of us struggle with it. For years, when all I had was an Etsy shop, I didn’t track anything properly and come tax time all I would do is print out a poorly kept spreadsheet, collect my bulging envelope of receipts and hand it over to the tax professional. I do not recommend this. Even if you are a very small, one person business and you think that you don’t make enough to need to keep good records I am here to tell you now that YOU DO! I’m going to break it down into four easy categories and show you how I do it. First of all, it is 100% worth it to pay for business finance software. I personally use QuickBooks Self-Employed which you can get for $5 a month here. It is so convenient and allows you to do all of your small business record keeping via phone app or computer. I personally exclusively use the app, it allows me to input everything in real time. The $5 a month price tag is well worth it to have a business tool always at your fingertips that will allow to do our four business bookkeeping basics (say that five times fast!). Step 1: Track all income. Whether you make $500, $5000, or $50,000, you should be tracking every bit of what your business makes. With the QuickBooks app, all you have to do is type in the information regarding the income, snap a photo of the payment, and voila, you’re done. If you’re really fancy, you can even send and receive invoices and link your bank account so all your transactions are added automatically. Easy mobile app pages for inputting income, expenses, mileage, and creating invoices. Step 2: Track all business expenses. Office supplies, maker supplies, business lunch with a client, marketing materials-- all of these things are business expenses that you should be keeping track of. This is crucial to your taxes as business expenses are tax deductible. The QB app even allows you to snap a photo of your receipt so keeping a messy envelope of paper ones becomes unnecessary. Step 3: Track all of your business related mileage. As a pet sitter, I accumulate A LOT of business miles. My whole job is driving to and from each appointment and the clients house. This is also important for your taxes as you get a mileage deduction. Yay! You should be logging your trips to the post office if you’re a store, mileage to and from meetings, your trips to see clients, any driving you do for home parties or shows, craft fairs, supply runs-- it all needs logged! Come tax time you’ll thank yourself. And yes, you guessed it, with the QB app you can use your phones GPS to start and stop your trips or enter them manually. Your quarterly tax estimation. You can see here how important mileage is because my first three payments are low, but I have not entered in any mileage from September/October and the payment is much higher. Step 4: Pay quarterly taxes. If you are self-employed you need to be paying your taxes. There is no employer taking money out of your check for you so you assume full responsibility. Even if you don't meet the requirement (click here to see IRS quarterly tax requirement) for being required to pay quarterly, it is still a good idea to keep you from owing money at tax time and being caught off guard. With QB and other similar software, this tax payment is automatically calculated for you based on income, expenses, and mileage. That is why those three things are key! I know this topic is not fun by any means, but it is the basis for your whole business and therefore very important! I know it seems like common sense to some of you, but for someone just getting started or someone who has no prior experience with bookkeeping, these basics are key! I'm going to say it right now: time management is crap. When you have a kid, or kids, all semblance of what you used to consider time management goes out the window. No longer can you plan your days down to the minute. If the baby needs fed, you feed them. If the diaper needs changed, you change it. If you give yourself 30 minutes to get the kids ready and out the door, odds are something will happen and it will take you 40. Our days cannot be as scheduled out as they used to be. The cold hard truth is that kids do not care about the strict schedule that you set for yourself. There will always be something that comes up and there will always be something that redirects your time from what you planned. If you don’t learn to adjust and roll with whatever life throws at you, you will feel like you are failing. As a new-ish mother, I have found myself getting frustrated that I always seem to be running late. No matter how well I think I've planned ahead to get somewhere on time or to get something done on a certain day, it never goes exactly as I envisioned. Things that used to take me an hour or two, sometimes take three days. It is so easy to beat ourselves up over this, especially when you're not only trying to accomplish personal tasks but also business related ones. As a pet sitter, I'm expected to be at my appointments at certain times. I plan ahead but often times I'm running 5 to 15 minutes off schedule. I have tried to combat this by giving people a 15 minute range of when I will be there. It has been a good solution for me, I actually found that people don’t care if you get there at 5:10 instead of 5:00 and now if I'm running a tiny bit late I no longer feel stressed or embarrassed. It turns out, I had been causing myself undue stress for months and odds are, so are you. The same time management problem can come up with goal setting. Most goal setting advice will tell you to be a specific as possible about what you want to get done every day and to start with the most important thing first to ensure that it gets completed. That does not work for me, and it probably doesn't work for you. As we have already discussed, kids don't care about your schedules and they certainly don't care about your to do list. If I make a list of five things I want to get done on a day and I only managed to get two done, I will feel terrible about myself and like I have failed. These feelings will then follow me into the next day and will continue to affect my mood and productivity. To get out of this rut, I've switched from a daily to do list to 30/60/90 day list. I start with the 90 days and come up with all of the major things I wish to get done in that time. Then I break that down into smaller sections that I place in the 60 and 30 day columns. The great thing about this method is you can change it to whatever number of days you want. You can do it for 7 days/14 days/21 days or literally any other combination that works for you. For business I usually do the 30/60/90 days and for household chores I generally do 3/5/7 days. As much as I wish I could sometimes put off cleaning for 60 days, that kind of time just is not realistic when laundry and clean dishes are involved. So for example, my current 90 day goal for my pet sitting business is to gain 10 new clients and update my website. Breaking that down, in the first 30 days I know I need to redesign and reorder my business cards and flyers to show new pricing and social media accounts. I also need to compile all of the new information that needs to go on my website. In days 30-60, I know I will now have all my new marketing materials, so I will start advertising. I will set a certain number of places per week that I want to leave flyers at. During this time I will also send all of my website information to the person who manages my site so that the changes can be made. During days 60-90, I will hopefully have been getting calls and can adjust my goal based on the response to my marketing. If I have gotten the number of clients I was hoping for, I will stop visiting places to leave flyers. If I have only gotten five out of the 10 then I will continue to flyer weekly until my goal has been met. The amazing thing about this method is that it is so much more flexible than a daily list. If I get my 30 day goals done in 10 days, then I just move on to the next set of goals early. If I don't quite get them done I simply move them into the 60 day category and continue to work on them. Is setting such long term to-do lists ideal? No. Is it realistic? Yes! There's nothing wrong with things taking longer than they did before, we just have to accept that scheduling and managing our time is different once kids are in the picture. This is especially true when we work at home or from home and have to balance running a business and taking care of a child at the exact same time. Does it take longer to get things done this way? for sure. Does it quell feelings of failure when things do not get done immediately? Absolutely. Whether you are struggling with getting out of the house in a timely manner or having a hard time completing business and personal tasks, you need to cut yourself some slack. We are no good to our families or businesses if we are constantly stressed and feeling guilty for not getting things done on time. I hope you will give this extended goal setting a try and see how it works for you. Hopefully, it will ease your stress and allow you to be even more productive. I would love to know how this method works for you! Shoot me an email at doingbusinessandraisingbabies@gmail.com or drop a comment below! Welcome to Doing Business and Raising Babies! Welcome to Doing Business and Raising Babies! My name is Brittany Vanover and I’m so glad you have joined me here. This project is very near and very dear to my heart. It is my greatest hope to turn this into an uplifting and supportive space for all you business mamas. Whether you are a mom who is balancing entrepreneurship and motherhood, a full-time working mom, a mom with a hobby you are turning into a side hustle, a mom going back to school (or going for the first time! ), or just a mother with business ambition who is searching for the inspiration to get started-- this is the place for you. When I became pregnant, I found it very difficult to find business related books and resources aimed specifically at mothers who were trying to build a business and balance that with motherhood. I wanted to create a community for this seemingly overlooked group of people. Balancing business and motherhood is hard, but not impossible. It is my goal to create a community that will help you overcome the challenges of taking on both of these things at once. We are here to learn from other mothers who have been where we want to be and who have done what we wish to do. Here you will find motivational content from some of my favorite books, interviews with other business mamas, business and motherhood advice, and so much more. I hope you find this to be the haven that you have been looking for and I'm so excited for us to get started and grow together!